It’s National Watermelon Day! I literally just found this out, but somehow happened to make and photograph this refreshing Watermelon Mint Martini last night. Talk about subconscious planing, phew! There’s actually a food holiday every day of the year in America. Show’s how much we love our food, right? Obviously it would be difficult to post a food holiday recipe every day, but maybe that would be a good ultimate blogging challenge. Watermelon is a joyous summer treat, and it was important for me to share this recipe with you on it’s national holiday. Fruit flavored martinis are fun to make and even more fun to drink. They’re fancy, sweet and make you feel special, at least I feel that way enjoying one. There’s an art to making a perfect martini, with a wide range of opinions on the best way. I’m sharing my tricks to making the perfect chilled martini. The best advice is to shake the drink like crazy in the mixer. Like you just had a stressful day, and the power went out, and you have a project to get done type of crazy. But that all washes away with this smooth, refreshing cocktail. Shake it long enough and you’ll see those treasured bits of ice crystals that form at the top when you pour; the ultimate sign of a well made martini. 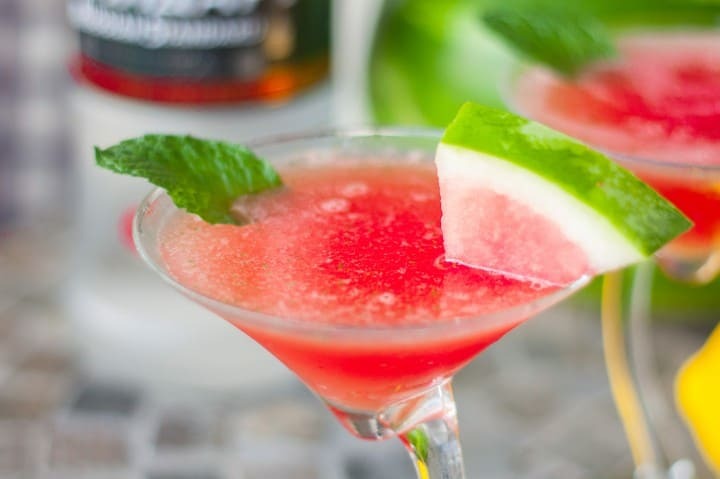 Fresh watermelon and sweet agave syrup combine with mint leaves and lemon juice in this simple, yet decadent Watermelon Mint Martini. Don’t worry about straining out the mint, it adds a nice visual flair to the drink when serving. 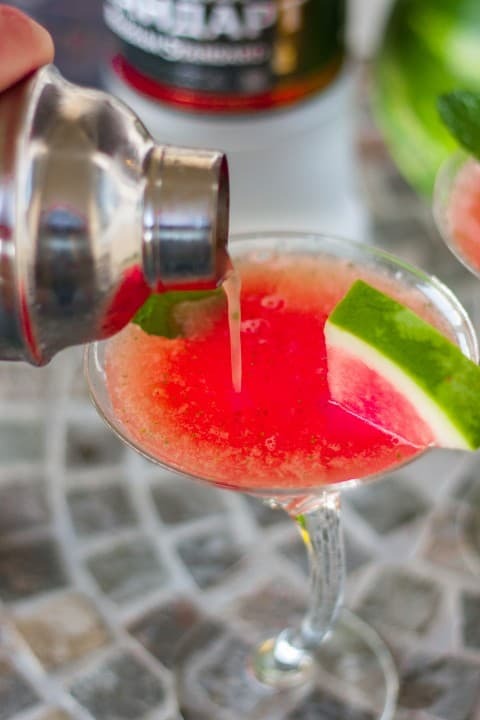 Watermelon is an ideal mixer for martinis, it consists of mainly water, and blends to a liquid in a blender or with an immersion stick; so you can add more or less depending on how strong you want your cocktail. I like to not chill my vodka for martinis. If you add it at room temperature to your martini mixer, it will dissolve the ice more, making a smoother, less alcoholic tasting martini. I shot this in natural light at 1/200 sec, f/ 2.0ISO 400 . Chilled fruit martinis are often enjoyed on warm summer days. I wanted to portray this with an outdoor shoot on my patio table. The tiles create an automatic backdrop. 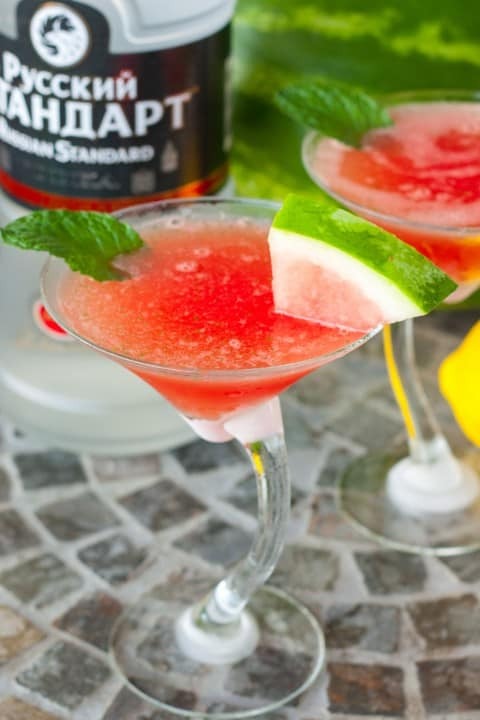 The watermelon, vodka bottle, and mixer create the ideal scene for the finished martini glass. A pour shot with a fast shutter speed of 1/200 sec freezes the action and adds a story element to the image. Fresh watermelon and sweet agave syrup combine with mint leaves and lemon juice in this simple, yet decadent Watermelon Mint Martini. Add all ingredients except ice to a blender, or glass if you are using an immersion blender. Blend on high for 1-2 minutes, until watermelon is completely liquid. Add ice cubes and blended watermelon mixture to a martini mixer. Seal and shake vigorously for 3-4 minutes, or until outside of martini mixture starts to frost. Martini will be at perfect temperature when this happens. Pour into martini glasses and enjoy immediately (do this over a strainer if you do not want bits of mint in the drink). Would this still be good without the mint?! Absolutely! There’s still plenty of flavor without it. ha! that WOULD be a fun challenge, blogging all the food holiday topics. maybe just for a month? this sounds great – so refreshing! Thanks Kristina! It would be fun, but having a full time job, near impossible. A lot of recipes in the queue would help. I’ll add it to my someday list. I need to go get a watermelon now. This sounds so refreshing and delicious! I love all the vibrant pictures too! Good thing they’re in season Kathy! Thanks so much! Looks delicious and so fresh! Perfect for summer time! 🙂 I will be tweeting it! It totally is Maryann. Thanks so much! Looks so refreshing, thanks for sharing! Yum! Of course Valarie! Thanks for stopping by! Looks fantastic, I love watermelon! What a great summer drink! Thanks Leah! Hope you have a great summer! Can’t drink quite yet, but I’m pinning this to my adulthood/married life board. Thanks Jade! I hope you enjoy and all of the other great things to come in life. Good luck! This looks amazing! I just love watermelon in the summer. My BF is a huge Vodka man, but it often upsets my stomach. You think rum might be good?? Thanks Taylor! I’m pretty sure it would be great with rum, since there’s often rum drinks that have juice. I would suggest a white rum, you may have to experiment with ratios. May have to try this one, I love watermelon! Thanks Nico! It’s good for those special occasions. Or omit alcohol and just have a watermelon fresca. Yum! This looks delicious. I love watermelon. I prefer my liquor room temperature for that same reason! I learned that tip from my brother and have done it ever since for any type of martini. Thanks Nikki! My husband would love this! He’s the martini guy in the family! Great tip on not chilling the alcohol, I’ll have to try it. This looks so refreshing, but with a boozy kick. My kind of drink. You should try it Steph, it helps get rid of that bite and makes it extra smooth. I don’t drink alcohol other than wine, but my family would love this! Wonder if you could make a watermelon sangria? Think I’ll have to investigate that. Thanks Fabiola!